One perk of winning the Super Bowl – as the Philadelphia Eagles did over the New England Patriots back in February – is the bling one receives as a shiny reminder of the accomplishment. But that’s neither here nor there. Here’s what is: If one’s inclined to believe a Sunday night Tweet from a gentleman named Robert Norton, a certain Super Bowl MVP by the name of Nick Foles left his ring behind during a stop in Collingswood. Granted, reactions to said Tweet were mixed. Some bought into it instantly. Others cast aspersions upon the claim, saying there was no way this actually happened. Norton, likely still sifting through the deluge of reactions, did not respond to a Tweet seeking more information early Monday morning. If he does, we’ll update this story, as we will should we hear back from Wawa's corporate public-relations office. For its part, the Eagles organization unequivocally shared that the post was a farce. 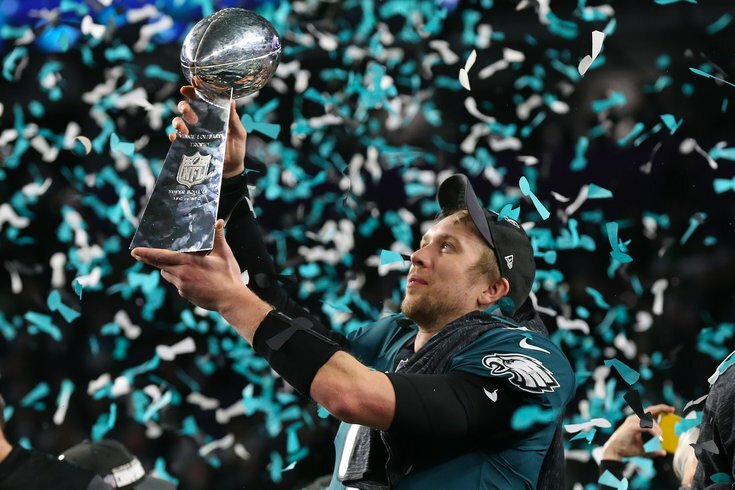 "We’ve seen the photo of the ring that you’re referencing, and that does not belong to Nick Foles," said John Gonoude of the team's public-relations office. "There are a number of noticeable differences that will show the ring is fake." In the fake ring, the Eagle eye is more rounded and the Eagle beak is bulkier than in the real ring. In the real ring, the head of the Lombardi Trophy consists of a large diamond that is outlined by a metal casing, whereas in the fake ring that does not appear to be the case. There are very clear differences on the inside of the ring. The font, overall, is completely different in the fake ring and the secondary Eagles logo does resemble what it actually looks like. In the real ring, there are four green sapphires on each corner that are also plated with other diamonds. That is not the case in the fake ring. If you look at the side of the ring where it has Foles’ name, you can also tell that the font is different there as well. In the real ring, the letters are much finer and closer together. The stadium graphic in the real ring is also more defined and the flags of the stadium nearly touch the bottom of the letter ‘L’ in Foles, which is not the case in the fake ring. Those are just a few of the discrepancies we have found just by looking at the photo. This seems to mesh with the words of the woman who, prior to the Eagles response, answered the phone at the Wawa along Haddon Avenue, near West Collins Avenue and close to many neighboring stores, on Monday morning.